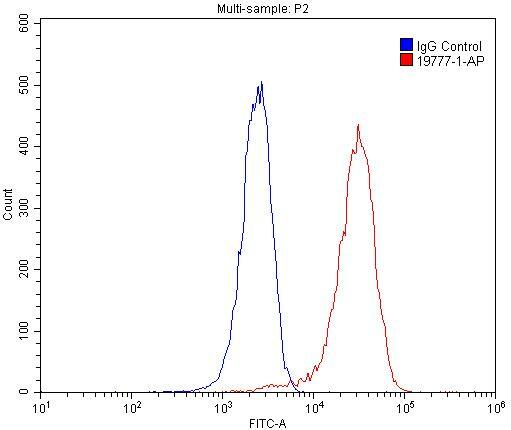 1X10^6 HepG2 cells were stained with 0.2ug ADRA1A-Specific antibody (19777-1-AP, red) and control antibody (blue). Fixed with 4% PFA blocked with 3% BSA (30 min). Alexa Fluor 488-conjugated AffiniPure Goat Anti-Rabbit IgG(H+L) with dilution 1:1500. ADRA1A, also named as ADRA1C, belongs to the G-protein coupled receptor 1 family. ADRA1A mediates its action by association with G proteins that activate a phosphatidylinositol-calcium second messenger system. Its effect is mediated by G(q) and G(11) proteins. The antibody is specific to ADRA1A. The ERK1/2 pathway participates in the upregulation of the expression of mesenteric artery α1 receptors by intravenous tail injections of mmLDL in mice.